While the news that Google is now an OpenID Provider was generally welcomed, a common chorus decrying their support (along with others large OPs like Yahoo, Microsoft and others) at best as half-hearted, at worst as ruining OpenID has revealed a significant barrier to such large providers becoming relying parties (even beyond usability). We need standard open-source components on as many platforms as possible to enable those rich-client apps to support OAuth. That includes a lot more platforms then just Windows and Mac. The harder part is mobile devices (Blackberry, Symbian, Windows Mobile, iPhone, and yes even Android), and other Internet connected devices like Tivos, Apple TVs, Playstations, etc. that have rich-client apps that ask users for their passwords to access services like Youtube, Google photos, etc. If we build these components, they will be useful not only to Google, but also to any other relying parties which have rich-client apps or exposes APIs, and it will also help enterprise SaaS vendors like Salesforce. As I’ve been thinking about this problem, I’ve come to see as an intermediate approach to full-on delegated authorization a simpler, perhaps more familiar approach that would be relatively easy to implement given common interface patterns today. For comparison, Pownce’s iPhone app originally used out-of-band browser-based authentication, leading to a swarm of user criticism resulting in a compromised solution that required embedding a web browser in the app. Less than ideal. In my proposal, rather than ask for a user’s password, an easier-to-remember OP-issued numerical PIN would be used to authenticate requests. Better is that this approach is already supported in OAuth, it’s just not widely used yet (though is similar to how Flickr authorizes mobile clients). The basic concept is that you’d have one password (or other strong authentication method) for your primary OpenID account and you’d have one (or more) PINs that you would use to access your account remotely — perhaps in limited risk scenarios or where (again) the full browser-based OAuth flow is not possible or warranted. Although I initially opposed FriendFeed’s use of Remote Keys, I now think that there’s some merit to this approach, as long as the underlying mechanism uses standard OAuth calls. There are plenty of holes in this approach, but insomuch as it enables an existing pattern to be phased out gently, I think it offers at least the foundation of an idea that could be useful. It also could be used as a counter-balance to some of the current thinking on federated login flows with OAuth. 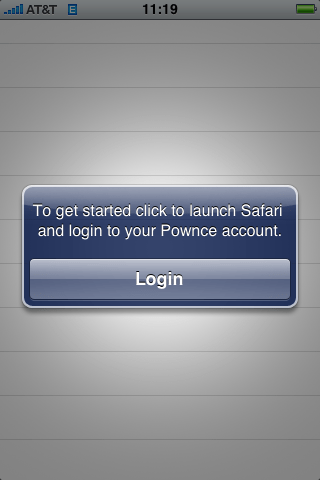 If you’re one of the lucky folks that’s been able to upgrade your iPhone (and activate it) to the 2.0 firmware, I encourage you to give the Pownce application a try, if only to see a real world example of OAuth in action (that link will open in iTunes). 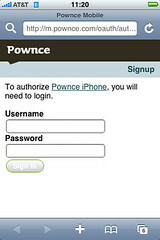 Pownce.app launches Pownce.com via an initial OAuth request; here you signin to your Pownce account using your username or password (if Pownce supported OpenID, you could signin with OpenID as well). 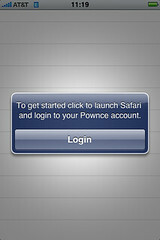 Once successfully signed in to your account, you can grant the Pownce iPhone app permission to access your account. Once you click Okay, which is basically a pownce:// protocol link that will fire up Pownce.app to complete the transaction. Second, it creates room for the adoption of OpenID — or something other single sign-on solution — to be implemented at Pownce later on, since OAuth doesn’t specify how you do authentication. 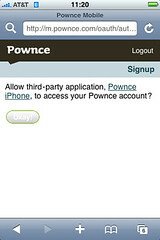 Third, if the iPhone is lost or stolen, the owner of the phone could visit Pownce.com and disable access to their account via the Pownce iPhone app — and not need to change their password and disrupt all the other services or applications that might already have been granted access. Personally, as I’ve fired up an increasing number of native apps on the iPhone 2.0 software, I’ve been increasingly frustrated and annoyed at how many of them want my username and password, and how few of them support this kind of delegated authorization flow. If you consider that there are already a few Twitter-based applications available, and none of them support OAuth (Twitter still has yet to implement OAuth), in order to even test these apps out, you have to give away your credentials over and over again. Worse, you can guarantee that a third-party will destroy your credentials once you’ve handed them over, even if you uninstall the application. These are a few reasons to consider OAuth for iPhone application development and authorization. Better yet, Jon Crosby’s Objective-C library can even give you a head start! Hat tip to Colin Devroe for the suggestion. Cross-posted to the OAuth blog. In January, I wrote about the “OpenID mobile experience” lamenting that it sucked and asking for positive examples of identity providers who got it right. Well, I didn’t get a whole lot of examples, but Ian McKellar (Songbird) did get inspired to hack something together called Twauth, which serves as the foundation for a flow that I’m going to articulate now. My initial approach was to offer an OpenID URL for phone numbers and use an SMS message containing a one-time password to verify that the person attempting to log in had access to that mobile phone. 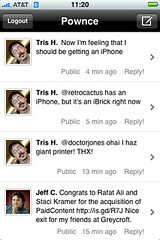 Unfortunately there’s no free web service for sending SMSes, so did the next best thing and built it on top of Twitter. Extending this, I have two variations of this proposal, that could work today. I will be using Brightkite as the example service, since they currently do not support OpenID but should and are at least interested. So, given that, here’s a proposal for how they could make it happen. The first approach requires no change to the OpenID protocol, but actually leaves out OpenID altogether beyond the initial association, which may or may not be a good idea, security-wise. Regardless, no one says you can’t do what I’m about to propose, so here we go. I already have an account with Brightkite, and use a traditional username and password to sign in. Let’s assume that Brightkite adds support for OpenID, and allows creating new accounts with OpenIDs or allows existing members to associate an OpenID with their account — by verifying against the identity provider — not just adding a URL to their account (as Beanstalk used to do!). Visit the mobile Brightkite site. If it’s not provided on the homepage, click “Sign in with OpenID” (remember, this doesn’t exist today). Enter your OpenID and hit “Login”. Since you’re on the mobile site, we’ll assume that you’re indicating to Brightkite that you want to use a mobile-friendly flow to authenticate. Since, Brightkite has already associated a verified phone number with your OpenID, they simply send an SMS to that number with a key (probably 5 numerical digits). 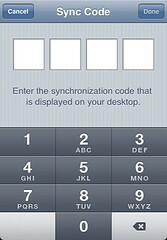 Once you receive the SMS from Brightkite, you return to the login flow and enter the key. If you provide the correct key, Brightkite should log you in successfully, since you’ve proven that you have control of the phone that’s associated with the OpenID you provided. The key to this flow is that you have verified both your phone number and your OpenID, and so essentially you’re transitively substituting an OpenID URL for your phone number. Is this OpenID? Well, insomuch as you can use your OpenID identifier to sign in on both the desktop (where the full roundtrip happens) and on your mobile device, I think it’s at least compatible in the interim. So why not just use your phone number to sign in? Well, you could, but as I’ll describe in the next flow, there might be a way for OpenID providers to do a better job with the mobile experience, and so starting here and training people to use their OpenID URL as opposed to a phone number to sign in to websites (and mobile experiences) seems like a good idea. Now, this entire flow is OAuth territory, but for the sake of discussion, I’m going to talk about the conceptual flow of OpenID. I recommend that anyone who wants to implement this flow actually look into using OAuth to support this mobile flow. In this flow, we start with the similar presumptions except that instead of storing the mobile number with Brightkite, we’re going to store it with the OpenID provider. As before, we start by visiting the mobile Brightkite site. If it’s not provided on the homepage, we click “Sign in with OpenID”. If your OpenID provider has a pre-defined mobile flow, or if you’re using directed identity (as Yahoo does) you’ll have to use the standard sign in procedure. This is how things are today. A slight variation to the previous step would be for the relying party (Brightkite) to indicate that it’s requesting a mobile flow in its original request, if available. This could be as simple as appending “?mobile=true” as a parameter hint to help the OpenID provider use a mobile-friendly authentication dance, rather than trying to recognize the relying party as a mobile site. As before, once you receive the SMS from Brightkite, you return to the login flow and enter the key. If you provide the correct key, Brightkite should log you in successfully, since you’ve proven that you have control of your OpenID identity. The major benefit to this approach is that you’re actually authenticating against your OpenID provider. Additionally 1) you never necessarily need to reveal your phone number to the relying party (say, if we weren’t talking about Brightkite) and 2) should you change your mobile number, you would only need to change it on the side of your identity provider, rather than on every site that offer a mobile version of their site, to continue to be able to authenticate with your OpenID URL. Finally, should a service or identity provider not wish to send (or pay for) SMS’, the alternative would be to allow someone to associate their Twitter account, via the Twitter API, to their existing account (e.g. their Brightkite account) and then to receive direct messages with the private tokens. The problem with this approach is that it uses Twitter, which may not be reliable, and that it also exposes tokens, via the Twitter API, to any other third-party services that can read your direct messages (basically any other Twitter app that asks for your Twitter account credentials). Still, for testing purposes, Twitter could be a useful intermediary.